Station 2 is located on Freemont Road and is manned by fifteen firefighters, two officers, and a base radio operator. Station 2 houses the following trucks. All units are staffed at all times. Car 2 is the Station Captain's vehicle and Car 22 is the Station Fire Investigator's vehicle. Engine 2 is a Fire-Fab M-Series four-man rear mount pumper. E-2 replaces the aging Engine 2 which was the oldest piece of apparatus in the LFC fleet. E-2 is an ALS-EMT engine. Quint 2 is a four-man quint with a 50ft. ladder and a 1500 gpm pump. It is modeled after a KME quint. The purchase of this truck gives some relief to the crew of Engine 2, as this truck is first responder to all calls other than rescue and auto related ones. Ladder 2 is a Fire-Fab K-Series two-man articulated boom truck. The truck has a 100ft boom with a platform which has a stretcher mount and a monitor which is pipe fed. The boom is opperated by the driver from the rear of the truck and also from the platform. Heavy Medic 2 is a Fire-Fab K-Series two-man ambulance unit. M-2 can carry a stretcher and two people in the body. The truck is staffed by three Firefighter EMTs and is an ALS unit with cardiac support. Utility 2 is a Fire-Fab L-Series two-man utility truck. This truck was sold to LFC at a discounted price to help judge response to Fire-Fab's new cab style. It carries mainly rescue type tools. 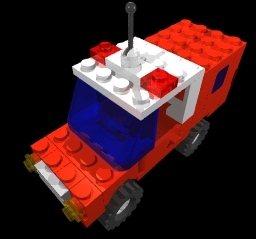 Car 2 is a modified version of LEGO� set 6643, A Chevy Suburban. Car 2 is used by the captain stationed out of Station 2. Car 2 is outfitted with minimal equipment, but has the capability to carry much more. Car 22 is a Lego Motors Brickera 4x4 pick-up truck with a custom built storage box on the back. This vehicle is used by the District 2 Fire Investigator. Boat 2, left, is a two person motor boat which can be used for rescues on either lakes or rivers. Snow 2, right, is a snowmobile used by the department to reach wilderness areas in the winter. Depending on the time of year, the appropriate apparatus is parked between Bay 2 and the Officer's Parking Lot. The other piece of apparatus is put into storage until it is needed again when the seasons change. Who says firefighters can't have fun when they're not out on a call.